Why choose winter tyres for your BMW? BMW winter tyres have been specifically designed to provide optimum driving, steering and responsiveness. They also offer increased levels of safety and improved braking distances in icy and wet weather. Our BMW winter tyres start from only 78, something to think about? ^Prices exclude postage and packaging. Delivery costs per two tyres: Mainland UK 14, Highlands and Island 20, Northern Ireland 22. For other areas and tyre quantities please contact us. When outside temperatures drop below 7Â°C winter tyres provide higher levels of safety and considerably shorter stopping distances. Winter tyres stop up to 20% quicker when driving in cold weather conditions compared to summer tyres. * Special rubber compounds offer increased levels of grip when outside temperatures drop below 7Â°C. ** Sophisticated tread patterns provide increased levels of safety and mobility. *Braking distance and wear rate information supplied by Continental Tyres. **Average UK temperature information sourced from the Met Office website. Data supplied by a leading UK car insurer. 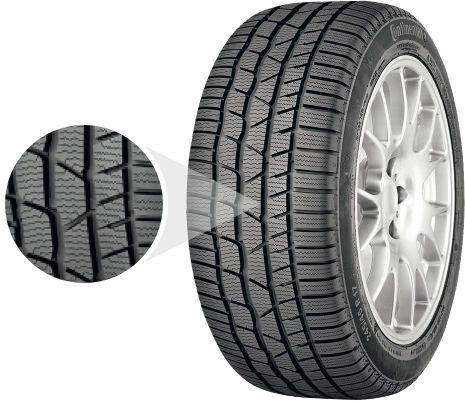 Visually you will only notice a slight difference within the tread of winter tyres compared to summer tyres. This is because they have an increased number of blocks, channels and sipes, which enhance grip on the road surface in wet and icy conditions. Winter tyres also have an optimised blend of rubber and silica compound, so grip and propulsion are significantly improved in winter.